Riverbloat Rapids is a secret level in Jiggle Jungle in the game Wario Land: Shake It! 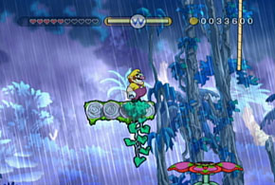 It can be explored if Wario finds the secret map in Soggybog River. It takes place in a deep and dark jungle with brown and murky water. Logs float on the water and can be used as platforms to get across the water. Common enemies here are Venus Guytraps and Turkeyjerks. Flaming Wario also makes an appearance here, with many treasures being behind Bonfire Blocks. The 'Golden Enemy' here is a golden Bandinero. Once Wario finds the caged Merfle, he'll have to use the Max Fastosity Dasherator nearby to run on the water and back to the start before time expires. This page was last edited on January 16, 2019, at 10:55.